Rob Murray (right) accepts the award. 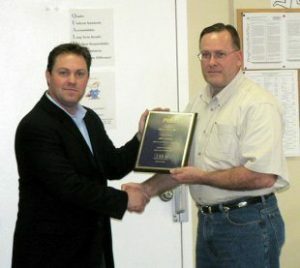 Blairsville manufacturer Panel Built, Inc. received an impressive award on Tuesday, March 13, 2007. The award was a plaque recognizing that the company had celebrated over a year without a lost-time injury. According to Insurance Office of America representatives Jason Peacock and Tricia Hushmire, a year without a lost-time injury is almost unheard of in manufacturing companies of similar size. Insurance Office of America is the carrier of Panel Built’s general liability and workers compensation policies. Panel Built is the third largest manufacturer in Union County with 51 full time employees. In honor of this achievment, company president Mike Kiernan gave everyone an hour of time off to use whenever they pleased.